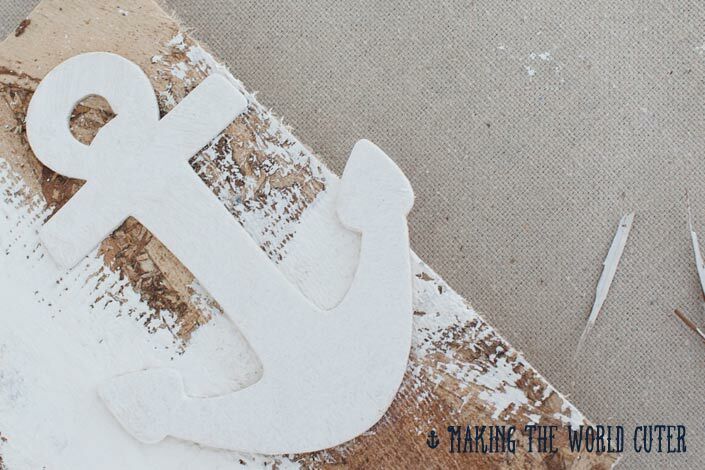 Do you love nautical decor too? Then this wreath is perfect to create. Going to the coast each year and staying in a minimalist beach house always makes me want to take a little souvenir home. 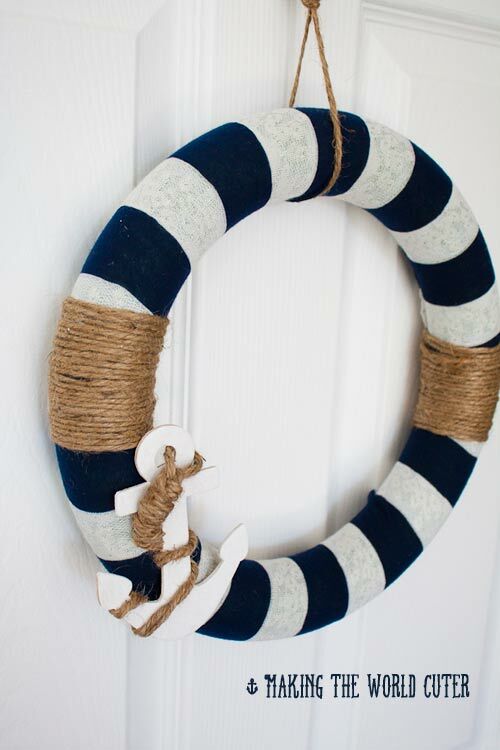 Nautical decor is one of my favorite classic styles that can look great season after season, year after year. 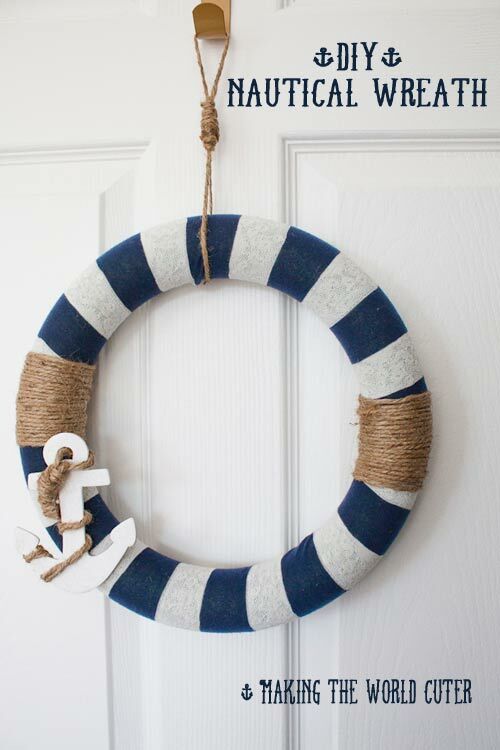 I seem to always come back to making nautical wreaths. This wreath is easy to put together and so super cute, you’ll want to make one for every door in the neighborhood! Well let’s get to it, and see how you can make this adorable little wreath! 1/2 yard of blue and white striped knit, this one has a cute lacey texture on the white stripe and I got it at Jo-Ann Fabric with a gift card that they gave me for this project. Cut strips of fabric just wide enough that it will fit comfortably around wreath. Overlap where you need to, and fold under rough ends. With a half yard and a 12″ wreath, you should only have to use 2 strips. Using a hot glue gun, glue fabric to wreath and remove pins as you go, be sure to glue only to the underside for the cleanest look. Cut two long strands of jute cord and glue one end of one to the underside of the wreath, over the overlapping part preferably. Wrap around until you have the desired look, glue the end. Repeat cord wrapping on the opposite side. 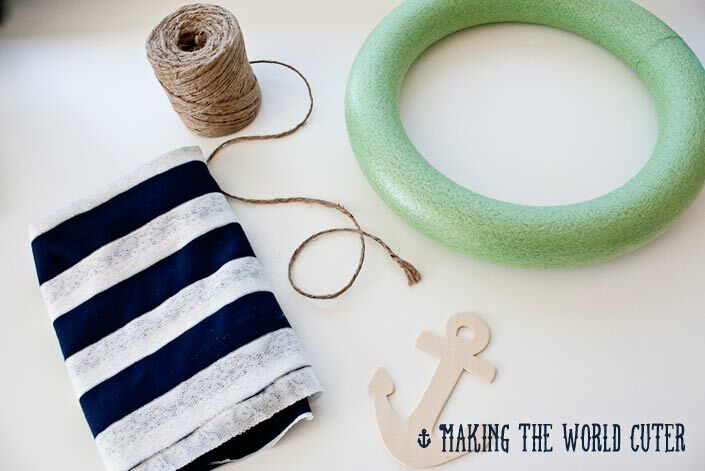 Now to get the jute to look like rope around the anchor follow these steps. Fold in half and slide through the hole to about half way up the cord. Loop your jute and tie a knot on the front side of the anchor, so there is a little loop on the backside. Using both of the strings of jute, wrap it around the knot and down until you have a long enough wrap. Secure with hot glue as you go. Now twist remaining jute around anchor for your desired look and secure the end with hot glue, clipping the end if needed. To attach the anchor to the wreath use hot glue, and if needed use a pin through the jute into the wreath to make sure it stays secure. To make the loop to hang the wreath cut a long strand of jute, wrap it around and tie a knot where you want the wrap to start. Make another loop for the top part and tie a knot next to the other knot and then using the remaining jute wrap it around the knots to make another wrap. Use hot glue to secure, and hang that baby up! Isn’t she cute!?! 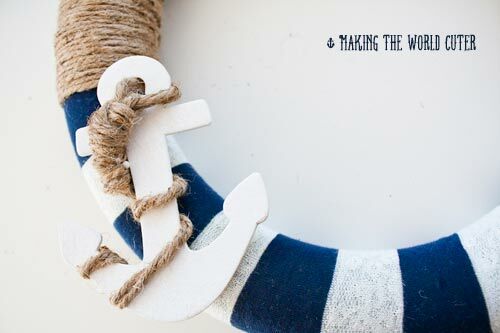 Such a fun nautical decor welcome home! I love the wreath! The rope is the perfect touch. Thanks Virginia! The rope around the sides was a last minute decision, I am sper happy with it!